The video footage shown at the Visions & Voices panel in 2013 to commemorate the unsealing of the Christopher and Webster commission findings by USC Libraries (past working title "LAR20"). The photo is with martyred Eddie Lee’s bust in the background. Who's the victim? 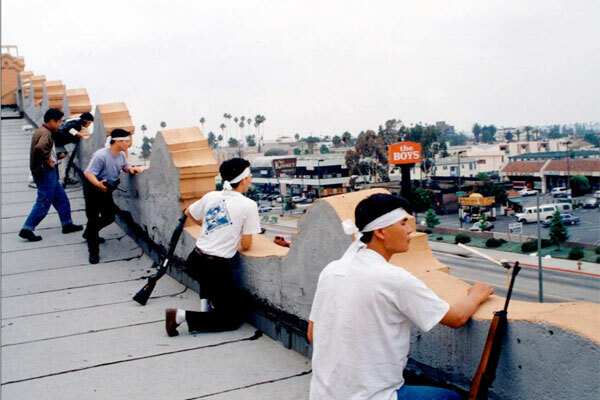 That was a central debate looking back on the Los Angeles Riots of 1992, which broke out when police officers were cleared of criminal charges in the beating of motorist Rodney King. For the first time ever, the invisible Korean American immigrant community finally got mainstream air time, but only while brandishing and firing guns at other people. Lacking political representation and being banned by the Asian Exclusion Act between 1924 and 1965, did this image harm this re-emerging community or protect it? Suffering half of all economic losses during the urban warfare, abandoned by the police, the post-1965 Korean American community viewed the media as scapegoating them as perpetrators of European American oppression. This year began the birth of their political consciousness. Fast forward 2012, art teacher Mr. Davis tries to teach the lessons of the 1992 L.A. Riots to his Korea Town students, Korea and Mexico being the highest represented national backgrounds. His high school is built on the ruins of the lavish Ambassador Hotel where Robert F. Kennedy was killed running for president in 1968. At $600 million, built in his namesake, this the most expensive public school in America. But in this city, where so many young people were inspired to rebuild communities from the ashes of '92, they don't teach the lessons of the Riots. Hardly do the activists even mention Rodney King, who experienced the original violence. Twenty years later, in the school's Egyptian-themed auditorium, two millennial friends, rapper Thurz and filmmaker Tomas, prepare a lesson plan. Perhaps the most powerful are the ones who listen.